The first news about the next part of the Mass Effect series appeared last November, when its developer - BioWare company - published the fresh teaser of the project, and a little bit later, some rumours about the races in the upcoming game appeared in the network. As it has become recently known, the representatives of BioWare will reveal the latest Mass Effect 4 details during the press conference at Comic-Con in San Diego, which will be held from 24th till 27th of July. “Mass Effect developers from the Edmonton and Montreal studios discuss what it’s like to expand on a well-established and beloved video game franchise. Panelists Carl Boulay (lead animator), Fabrice Condominas (producer), Mike Gamble (producer), Noel Lukasewich (senior artist), and Jessica Merizan (community manager), share their experiences in shaping the next Mass Effect game with new possibilities while staying true to the critically acclaimed series”, - says the official Comic-Con’s press release. So, let’s hope that the Mass Effect 4 details, which BioWare is going to share with the fans of the franchise, will also include some news concerning the game’s plot and characters. Earlier, the studio mentioned that the next part of the series will become the start of a brand new story, in which we won’t see Commander Shepard and other famous characters. Besides that, today, the project’s producer - Mike Gamble - has posted a short survey in his Twitter account. Its goal is to find out how well the players know the series and which wishes they have for the next game. So, if you’re willing to help the developers and share your opinion, then you are able to take the survey right here. Are you excited about the new game? 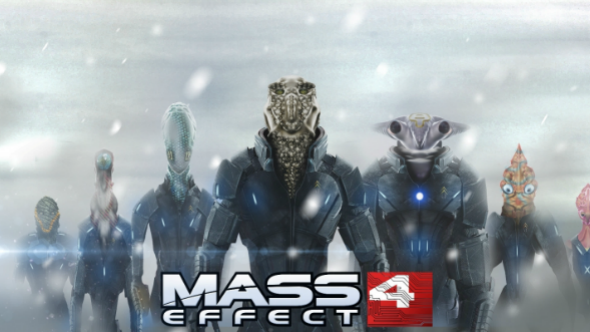 Do you anticipate to learn more fresh Mass Effect 4 details?